The loss of a child is the greatest tragedy a parent can experience. It also traumatizes everyone who is close to that child – grandparents, siblings, neighbors, classmates, aunts, uncles, and friends of the family. Rachel passed away so suddenly and unexpectedly that it shocked us with an awareness of how vulnerable our own families were. It left us not only grief stricken but feeling helpless. When the idea of creating a foundation in Rachel’s name began circulating, we embraced it. We were powerless to save Rachel but, we could save other children whose lives were imperiled by congenital heart disease, and spare their families the anguish we felt at the loss of a beloved child. The Foundation began tentatively in the living room of Joan and Alan Fierstein. We were ordinary people with no experience in fundraising or the intricacies of organizing a foundation. We sought the advice of another family that had started a foundation and began taking our first stumbling steps to organize ourselves. We reached out to the Pediatric Cardiology Department at Montefiore Medical Center because they had provided excellent care to Rachel when she was an infant. We brainstormed fundraising ideas and tapped every resource imaginable. Our first project as a Foundation was a modest one, which perfectly matched our humble bank account. We built a much needed playroom for the children hospitalized at Montefiore for cardiovascular procedures. It was a cheerful oasis from the tedium of the hospital room. It raised the morale of the children and the staff but it also inspired us. We had succeeded in our first step and we now had the confidence to aim higher. Over the next few years as our donor base increased, we contributed equipment to build a stress test laboratory and an echo cardiogram laboratory. We created our Heal-A-Heart Program to sponsor surgeries for children from countries that did not have the trained physicians to do pediatric cardiac surgery. We forged a partnership with the nation of Cyprus and brought 34 of their children to Montefiore for life saving open heart surgery. We contributed annually to a summer camp in the Berkshires that provided a therapeutic program for children who had had open heart surgery. We sponsored fellowships to train pediatric cardiovascular surgeons. And then in 1999 we accepted our biggest challenge when we pledged one million dollars towards the creation of the Children’s Hospital at Montefiore Medical Center (CHAM). We are educators, parents, executives, business owners, grandparents and professionals in a variety of fields who share a commitment to children. Our medical team informs us that our Heal-A-Heart Program has saved the lives of over 800 children worldwide and the newly expanded Rachel Cooper Children’s Heart Center at CHAM will treat over 9,000 children annually who suffer from congenital heart defects. The key to our success is that we are an all volunteer organization. Members give their time to fundraise, write the newsletter, do the mailings, visit children in the hospital, audit the Foundation’s books and even created this website. No one receives a salary or any other compensation for their work. 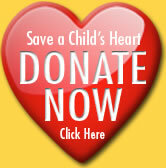 This insures that we can fulfill our promise that 100% of all donations will be dedicated to programs for children.